What do you think of when you think of fall? Beautiful orange and red leaves, pumpkins, sweaters, and Halloween? Personally, I can’t think of fall without thinking about warm, delicious apple recipes. 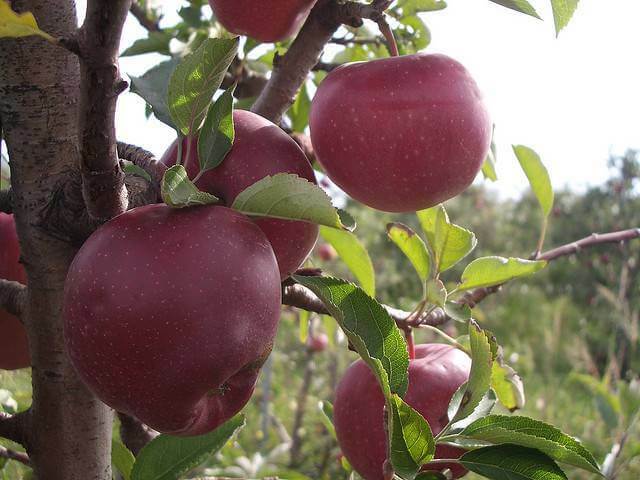 There is nothing like taking a trip to an apple orchard to pick your own apples for homemade treats the whole family will enjoy. With so many apple recipes out there, it can be hard to decide which ones to make. 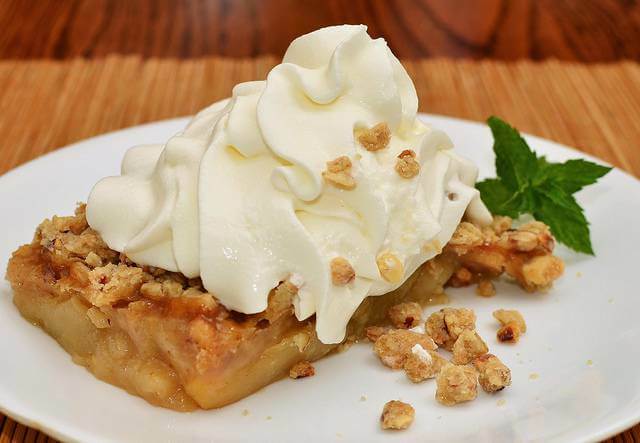 Never fear: I have searched out and found seven of the best apple recipes. The only work you have to do now is the cooking! This is one of my favorite recipes because I always have the ingredients on hand and it is very easy to make. Apples, brown sugar, flour, oats, butter or margarine, cinnamon, and nutmeg are all that is needed. There is nothing difficult about this recipe, although peeling and slicing the apples can be time-consuming. I have collected several peelers over the years, so I just hand family members a peeler and a couple of apples and it’s done in no time! This recipe is absolutely delicious despite its simplicity, especially with vanilla ice cream. If you prefer savory to sweet, this recipe is for you. Gala apples, apple brandy, apple cider, thyme, and a boneless pork shoulder roast are the main ingredients in this delicious recipe. The best part about it besides the taste is that it cooks in the slow cooker all day, which is perfect for those of us with busy lives. I find an apple corer and slicer to be a real time-saver for recipes like this that require several apples. I love pumpkin recipes almost as much as I love apple recipes in the fall, and this recipe combines the two. This is another easy recipe that calls for ingredients you probably already have on hand. Tart apples and canned pumpkin combine with eggs, flour, vegetable oil, and spices to create scrumptious muffins just perfect for brisk fall breakfasts. Here is a savory side dish perfect for fall potlucks and for Thanksgiving. Do you ever get tired of the same humdrum stuffing? I know I do. Put a new spin on an old favorite with this recipe. Apples, honey, red wine vinegar, Italian sausage, spices, leeks, and parsnips are some of the exciting ingredients that give this stuffing a different taste. You may want to carry copies of this recipe with you to the potluck because people are going to want the recipe! This isn’t a warm, cooked recipe, but I had to add it because it is such a great idea for a Halloween party or fall snack. All you need are four simple ingredients: red apples, lemon juice, peanut butter, and sliced almonds. Cut your apple into quarters and core it. Brush on lemon juice to keep it from turning brown. Cut a wedge from the side with skin in order to make the mouth opening. Fill the opening with peanut butter, and place the almonds inside to serve as teeth. This recipe is healthy, quick, easy, fun, and delicious: What more could you ask for? Here is a main course worthy of Oktoberfest. Caramelized apples and onions, sausages, vinegar, and brown sugar combine to create this delicious meal. Any apples or dinner sausages will work for this recipe, and it is ready in 35 minutes. Celebrate your German roots or teach the family about Germany while enjoying this dish. I just couldn’t list fall apple recipes without including one for apple pie; however, this one is a little different, since it is for caramel apple pie. Caramel apples and apple pie are two of my favorite fall treats, and this recipe combines them both. This recipe includes a recipe for pie dough, but I usually cheat and use store-bought pie crusts. Apples, tapioca, sugar, egg, cinnamon, and lemon juice make up the apple filling of this pie. Brown sugar, butter, heavy cream, and pecan halves create the caramel topping. This pie won’t last long after it is out of the oven!